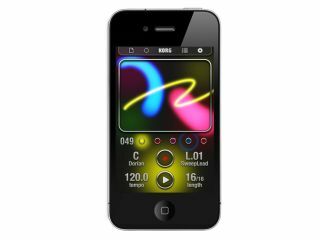 Korg iKaossilator: create Kaoss anywhere. Given how perfectly suited the iPhone is to being used as an X/Y pad, a mobile version of Korg's Kaossilator was always a no-brainer. And so we have the new iKaossilator, which has appeared on the App Store this very day. The full details are below, but the bottom line is that you can make music with the app just by "stroking, tapping or rubbing" your Apple mobile device's screen, which also displays visual effects. There are 150 built-in sounds, scale/key settings and a five-part loop sequencer. The Korg iKaossilator is available now from the App Store priced at £6.99 (the price will double as of 30 November). There's no native iPad version at this time. iKaossilator uses the unique X-Y interface made famous by Korg's entire Kaoss Line, including the original hand-held KAOSSILATOR. Create melodies and phrases simply by stroking, tapping, or rubbing the touch screen with your finger; no musical knowledge is required.